Goodreads summary: "Last spring, Nikki Beckett vanished, sucked into an underworld known as the Everneath, where immortals Feed on the emotions of despairing humans. Now she's returned - to her old life, her family, her friends - before being banished back to the underworld... this time forever. Really, that is my first reaction upon finishing this book. And I cannot think of a better way for a book to leave me feeling. I mean, I fell in love with the cover before I even knew what the book would be about (LOOK AT THE PRETTY!!) and when I came to understand that it was a YA mythology I went all crazy-eyed and just felt the urge to HAVE IT. So to say that I was beyond ecstatic when I received the e-ARC is putting it mildly. Wow, what a great review! I read one yesterday that was less than thrilled with Everneath, and I was kind of discouraged since I JUST got it out of the library. But I guess people will just have different opinions (duh). Your review revived my excitement to read it! EEEEEEEEEEEEEEEEKK!!!! 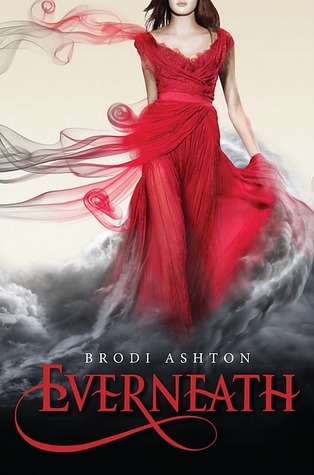 I love this review so much - because it so mirrors my own feelings toward this book (read my review here: http://yearningtoread.blogspot.com/2012/01/review-everneath-by-brodi-ashton.html). It is seriously brilliant. I love Nikki soooooo much - they way she grew and became an awesome, selfless heroine was amazing. And JACK. Oh. Don't even get me started on him. I will talk and talk and talk and talk and talk and TALK AND TALK AND TALK about him for HOURS. Because he's just that wonderful. And YES! The awkward scenes of them sitting side-by-side in class seriously made me love the book even more! I read this book based on your recommendation, and I loved it! I am not happy that I have to wait a year for the next one to come out! I really loved this book too; I wasn't even going to read it until I was assured that there was no love triangle. And I am so happy I listened to those wise recommenders as this book made me so happy and I am a HUGE fan of Jack-what a great guy!